If this week of mine is full of tiring presentations, it’s different in their world. It’s a week full of love for everyone! How I wish I can live like them, but they also have their own problems. After all, dramas are all about humans, and where we can find living souls without a problem? Even the happiest people have their own hard times. It’s just they know how to enjoy their life to the fullest. Plus, being a person full of love is a big help too. Cuteness is always there but this time, even confessions are everywhere. It’s still early, right? Especially for someone as playful as Ji-Heon. 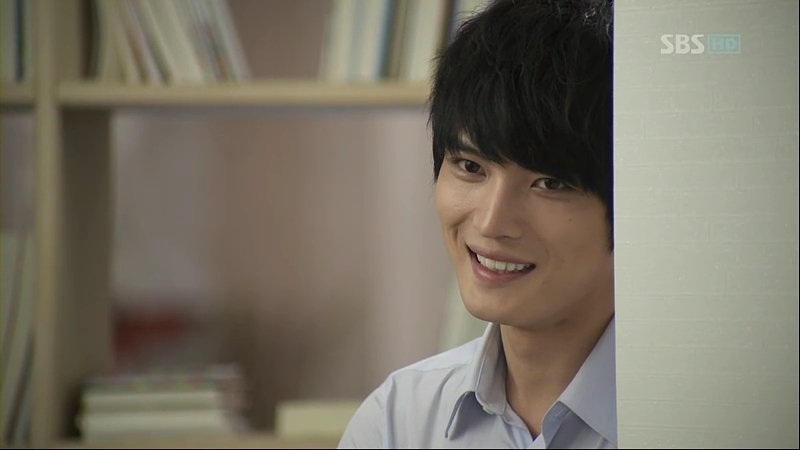 Ji-Heon ah~ He’s so confident to admit his feelings to Eun-Sul. Well, not that confident at first, but at least he has the guts to tell the truth. After all, Ji-Heon himself is someone who speaks out his mind. He does have childish attitude, but he isn’t someone who keeps his feelings to himself. That confession is sure the cutest confession I’ve seen. She doesn’t want others to look down on them ,especially on him. She doesn’t want Chairman Cha to kick her out of her job. She likes him, but only as in employer-employee relationship. She may looks like she’s a selfish person because basically, she’s just trying to save herself from any harm. But then, the person that she is really trying to protect is Ji-Heon. Eun-Sul knows that people won’t go easy on him if this kind of thing is let known to others. She is a little harsh on the soft hearted Ji-Heon, who goes all melancholic when he’s half-rejected, but she is taking the best decision here while actually, she herself is confused. cutie Ji-Heon tends all the holes and cuts on the cardboard with plasters. Can he be any cuter? It’s quite an irony because he treats the cardboard like his princess and speaks sweetly with it but when he’s with the real Eun-Sul, he likes to argue with her. And he decides to try changing her mind while she’s giving him the time to think back about his feelings to her. With that, ‘Operation Make Her Like Me’ versus ‘Make Him Dislike Me Mission’ simultaneously come into the life of this pair of boss and secretary. He begins to wear his best attires to the office every day while she goes from being a smart to a messy secretary. Why they are so childish? Not that I’m complaining. It’s so fun to see them in their silent war. And their post-kiss reactions? Priceless. The best reactions so far. A phone call changes the atmosphere abruptly, from a romantic one into a fighting mode. Eun-Sul comes into her sense and launches into her attack mode while Ji-Heon begs for his life. And after that, they just settle it nonchalantly without so much awkwardness. That’s why I adore them so much. And that’s not the end. Ji-Heon’s attempt to change Eun-Sul’s mind doesn’t stop there. He starts to take the next step: wooing her straight in her face and spluttering sweet words around her to make her feel something towards him. The outcome? Nothing like that. Instead, it just makes her having goosebumps to hear him talking like that. Ji-Heon is like a kid, and just like what Eun-Sul is thinking, he might be hurt later. Oh, I hate to think like that but there’s possibility of it. The scene when Mu-Won offers to help her find another job really makes me nervous. Eun-Sul says that for now, she’d like to stay and finish her job there, but in the future, there might be a time that she’ll need to go. Show, please don’t separate them! I don’t want my source of laughter to be sad! Still topping the chart for the most mysterious character this week, Mu-Won just add more mystery to himself. There’s no single hint about what he actually thinks all the time and I realized that he’s actually full of silence, expect at times when he’s ready to open himself to others. His confession to Na-Yoon is so unexpected. He’s full of hope that she’ll come to his side after she settles her feelings to Ji-Heon, but Na-Yoon refuses to do the thing that she once did. It does look like he’s liked since a long time ago. Na-Yoon also likes him, but she isn’t ready to let go of Ji-Heon yet. Mu-Won’s heartbroken face…I can’t look at it. He’s like someone who has drained out his energy, plus with all the things going on in the company. He’s able to be a little carefree when he’s with Eun-Sul and he treats her with warmth that only a person that’s close to him will get. He planned to use her but he’s not going to do it anymore. Now I’m a little confused here: whom he actually loves? Na-Yoon? Eun-Sul? Or both? Wow, what a complex love line we have here. With that confession he makes to Eun-Sul, it’s unclear whether he’s doing this earnestly or it’s part of his unknown plan to thwart Chairman Cha’s wish to make Ji-Heon the heir. ~It must be hard on Eun-Sul now. She has two men lingering around her, with another woman hovering around. How they invent names for each other: Miss Ice Cream (Na-Yoon), Miss Wrestler (Myung-Ran, given by Ji-Heon), Bun Head (Eun-Sul, also thanks to Ji-Heon), and Mu-God (Mu-Won). Mu-Won’s mother goes playing Whack-A-Mole to release her anger. Chairman Cha and Mu-Won’s mother endless bickering. Grandma and Chairman Cha’s moments. Na-Yoon ‘practising’ her new martial arts skills with her mother. Chairman Cha’s charity services. LOL sorry but I really enjoy watching him dancing as Dooly. Mu-Won’s drunk and post-drunk expressions. Eun-Sul and Ji-Heon’s awkward congratulatory hug. Things are picking up and everyone’s getting pretty serious right now. But there’s no preview that can make me a little bit relaxed here. Oh, I’m trying hard to be patient here. Wednesday, come faster! Confession and rejected at the early episode?….hhhmmmmm…similar with “The Greatest Love” storyline….. i think the script writer have to be more creative.